A heart attack happens if the flow of oxygen-rich blood to a section of heart muscle suddenly becomes blocked. 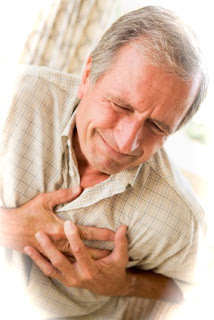 Most heart attacks occur as a result of coronary heart disease (CHD). CHD is a condition in which a waxy substance called plaque builds up inside of the coronary arteries. These arteries supply oxygen-rich blood to your heart. When plaque builds up in the arteries, the condition is called atherosclerosis. The buildup of plaque occurs over many years. Eventually, an area of plaque can rupture (break open) inside of an artery. This causes a blood clot to form on the plaque's surface. If the clot becomes large enough, it can mostly or completely block blood flow through a coronary artery. If blockage isn't treated quickly, the portion of heart muscle fed by the artery begins to die. Healthy heart tissue is replaced with scar tissue. This heart damage may not be obvious, or it may cause severe or long-lasting problems.